"How much is that doggie in the window? I do hope that doggie's for sale." 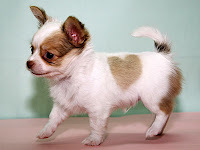 A Chihuahua puppy born in Japan with a natural heart shaped pattern on his coat has captured the hearts of animal lovers around the world. Heart-kun, as he has been named by owner Emiko Sakurada, was born on May 18, 2007, one of a litter of puppies at the Pucchin Dogs shop. His natural heart-shaped markings on his fur have made him an instant star in Japan. And it was a case of puppy love across the world as the tiny dog made television appearances worldwide. 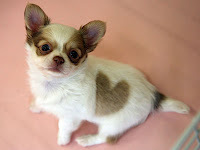 Shop owner Ms Sakurada got the surprise of her life when she saw the birthmark heart markings in the fur of her tiny pooch. She said it was the first time a puppy with these marks had been born out of the 1,000 animals that she has bred. Since Heart-kun was born, he has brought a lot of luck, according to Ms Sakurada. He sister got lucky on the lottery and won a concert ticket. Heart-kun's owner has been inundated with requests from people wanting to purchase the unique puppy. But they can keep their paws off him, she says, for her little four-legged friend ain't going nowhere! memang lucky...the owner jadi famous satu dunia. Amat mai nasib meh anak ukoi nya! Enti aku bisi ukoi baka nya, aku pen ka publicize iya! Heheh.